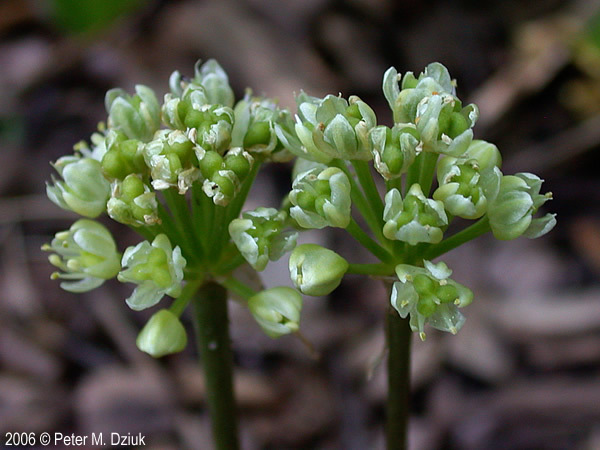 Allium tricoccum. leaves. © 2008 K. Chayka. Minnesota Wildflowers. minnesotawildflowers.info (Accessed 4/2017). Allium tricoccum is a spring ephemeral, perennial, monocotyledon herb, from an oval-conical bulb, 2-5 cm long, it is colonial, probably from bulb offsets; roots produced in summer when leaves have died back, roots associated with VA mycorrhizas (Brundrett and Kendrick 1988). 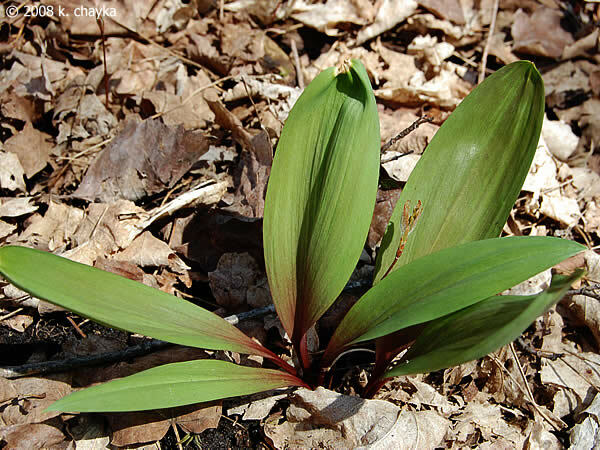 Leaves alternate, 1-2, blade broad, flat, 10-20 cm long, 2-6 cm wide, stalk slender, about 10 cm, appearing in early spring, dying by early June after forest canopy closure, leaves last 10 weeks (Hicks and Chabot 1985). Allium tricocum. flowers. 2006 © Petet M. Dziuk. Minnesota Wildflowers. minnesotawildflowers.info (Accessed 4/2017). Flower white, radially symmetrical, petals 6, oblong, 0.5-0.7 cm long, each on a short stalk in an umbrella-shaped cluster at the top of the main stem; inflorescence stalk appearing after leaves die back, 15-40 cm tall; blooming June-July. 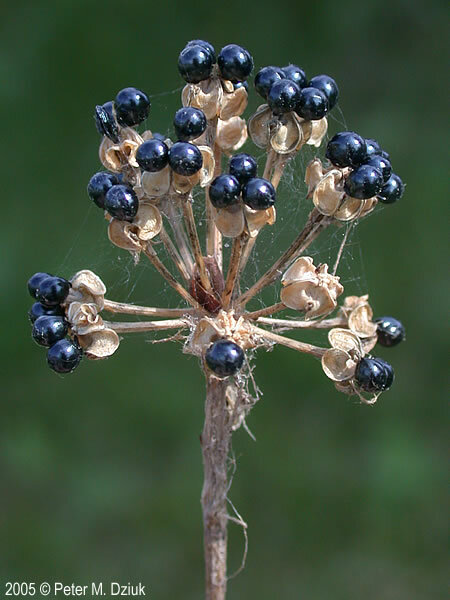 Fruit dry, hollow, a deeply 3-lobed black capsules each section with one seed. No apparent dispersal mechanism. Notes: Rate of migration to distant or disconnected forest sites has been measured as 0.87 m/yr (Matlack 1994). A forest interior herb (Matlack 1994). Requires at least 0.5% full sunlight to survive (compensation point) but cannot use more than 20% full sunlight (saturation point) (Hicks and Chabot 1985).